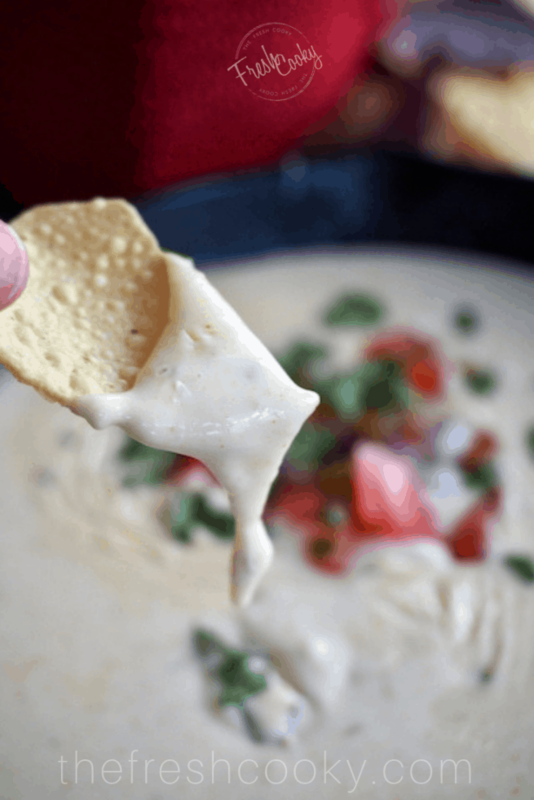 A creamy white queso dip recipe you can get behind! Loaded with real cheese, green chiles, and aromatic Mexican spices. This EASY creamy queso uses all-natural ingredients, stays smooth and creamy and tastes spectacular! No fake cheese or velveeta here! 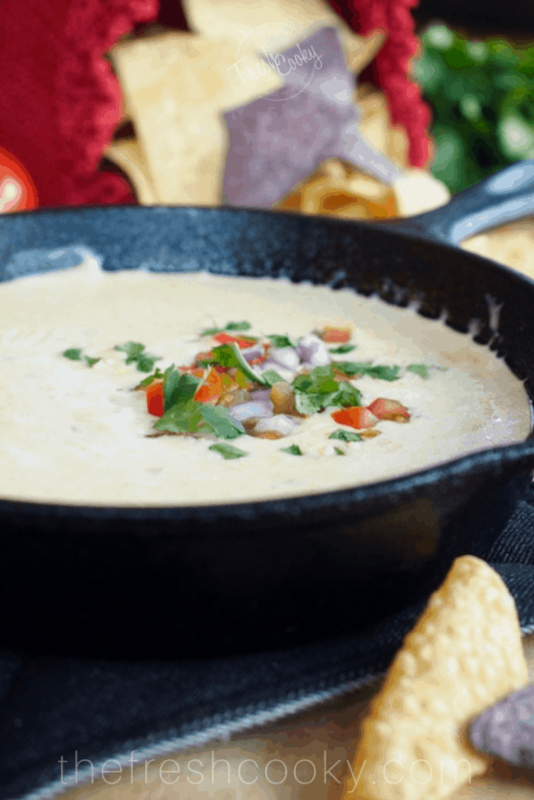 What is it about a great queso!? I’ve never been a fan of fake cheese, bright yellow or orange quesos. Have I eaten them? Oh sure, but I can’t say I feel good about them and so I’ve been on the search for a great recipe, that uses real ingredients — I’m pretty sure I’ve found THE recipe! 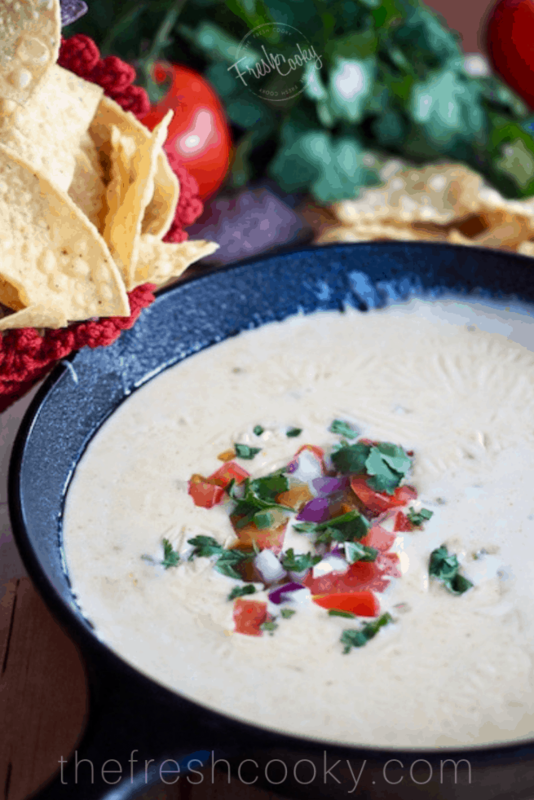 I’ve made and tweaked this recipe many times now, getting it just the way we like it and after serving for several high schoolers, young and old-ish adults at a party last weekend, the reviews are in that this is AMAZING queso! And just in time for game day this weekend! 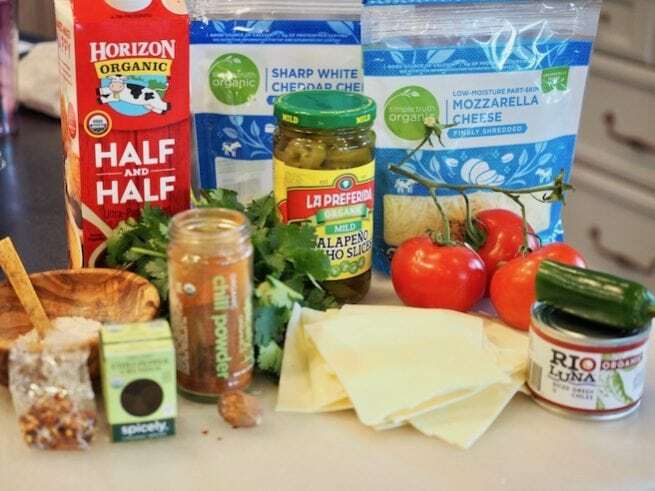 Prep your ingredients — once you start this recipe, you shouldn’t stop stirring! Chop, open, mince, dice, and measure. I used whole milk, all-natural white American cheese from the deli; have them slice it thin, then it’s easier to chop into small pieces. 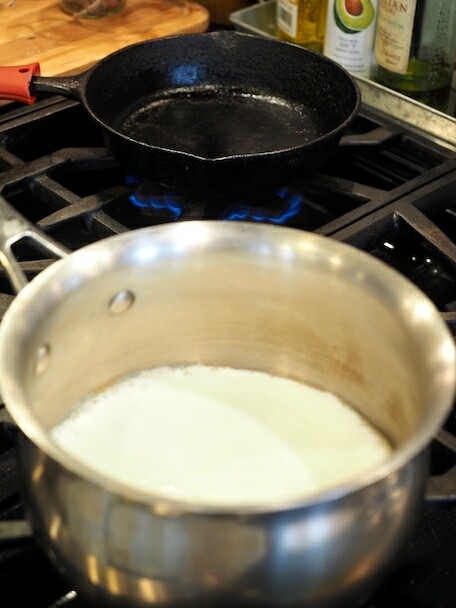 Pour half-and-half into a medium (heavy-bottomed) pot and heat over medium-high heat. Once it starts simmering, but not boiling (it will crawl up sides of pan slightly when ready), reduce heat to low. If using warm a cast iron skillet on low on the stove or in the oven. 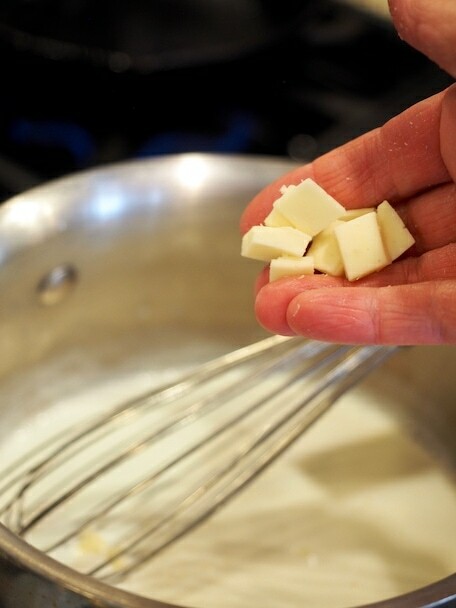 In small batches add your American cheese into the cream, whisking until smooth before adding more cheese. It melts quickly, so keep adding a little at a time. Once your American cheese has been incorporated, start whisking your mozzarella and cheddar cheese into the queso, again in small batches. 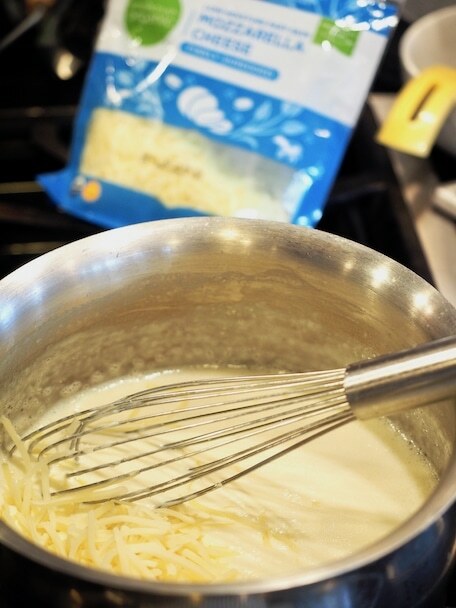 Whisk until melted and smooth. You are still whisking right? Don’t stop stirring! Stir in the green chiles or chopped jalapeños if preferred. 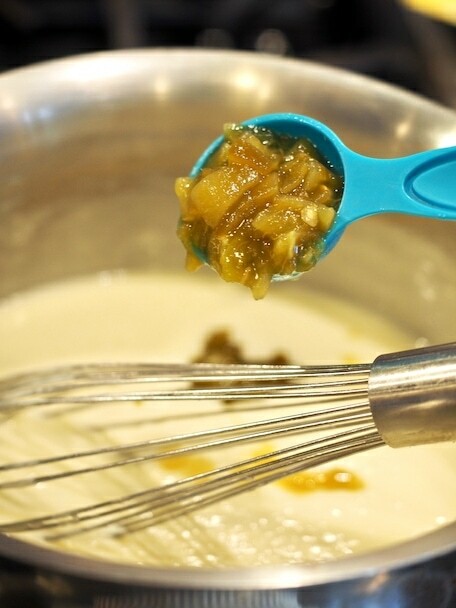 Whisk or stir until mixed. 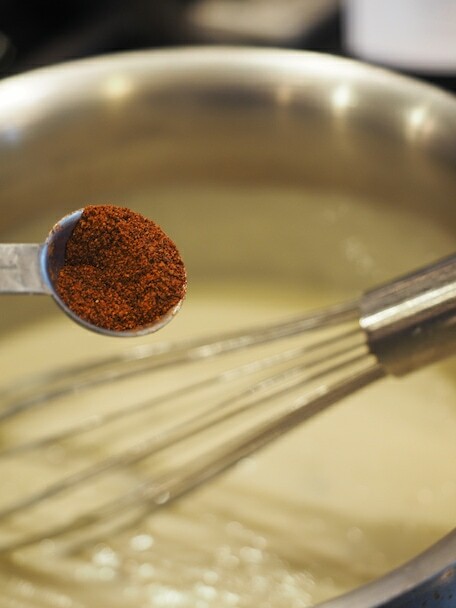 And the chili powder (optional), ground nutmeg (optional), red pepper flakes, sea salt and white pepper. Stir well. See notes for other options on spices. Remove from heat and pour into a porcelain or ceramic serving dish or a small cast iron skillet. Cast iron works great since you can heat them ahead of time and they hold their heat for a while, but not forever. If rewarming is needed when serving in cast iron, return to the stove top over low heat, adding a splash of cream or milk; stir to blend. You can also pour into a mini slow cooker for serving, it will keep it warm and smooth, stir occasionally. 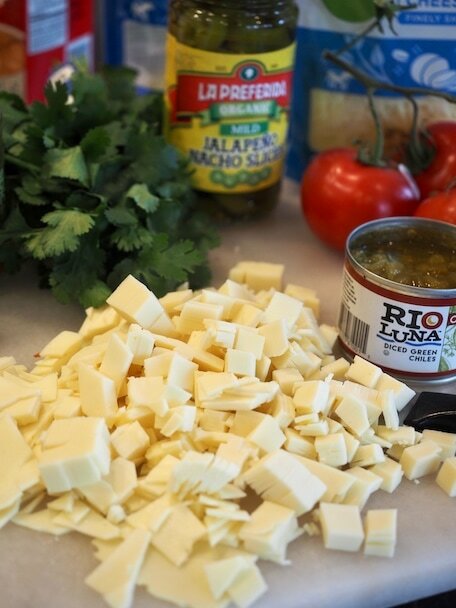 Add all or some of the garnish suggestions below to the top of your queso; it adds a pop of color, but adds flavor too. Serve with your favorite tortilla chips and enjoy! I love warm tortilla chips. To warm spread a layer of chips on a cookie sheet and warm on 250º for 8-10 minutes until warmed or place in microwave safe bowl and heat on high 30 seconds at a time until warmed. Invite some friends over, turn on a game, enjoy dipping pool-side, or serve over your favorite Mexican dish (try on burritos, bowls, tacos and in quesadillas), make a few other incredible appetizers, like this and these sliders, mmmmm….good! Looking for more of a make-ahead, but still wows your friends and family appetizer recipe? Try these Cheesy Dips! My son just requested queso for super bowl, healthy or non healthy, he didn’t care. Thank you for giving me a healthy option!! Heidi that is fabulous, so excited to hear that! I’ve made this numerous times now and it’s a HIT every time. Pretty sure just this weekend people commented they ate more than their fare share! 🙂 Hope your family loves it!